At dawn on day 4, we rounded the picturesque friars east of Cabo Falso and watched as dozens of beachside resorts came colorfully into focus. 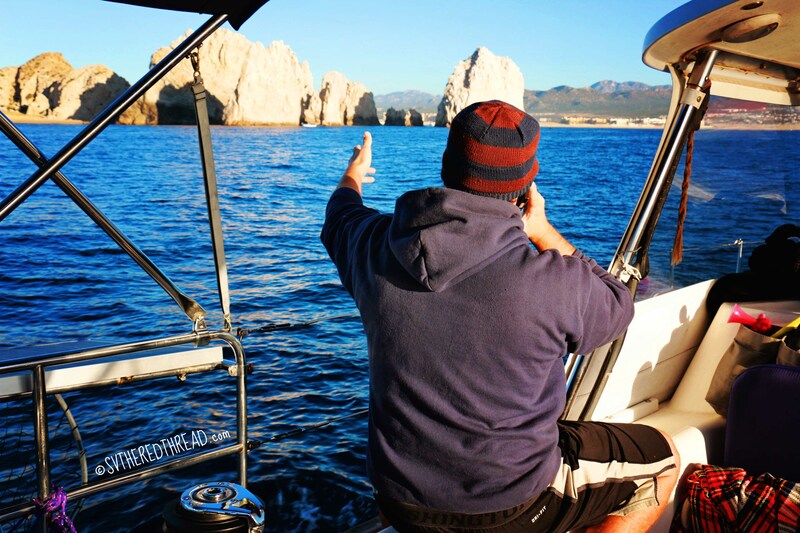 After days enveloped in the beautiful bleakness that is the ocean, Cabo San Lucas was a shock on our senses that felt like a cross between the refreshing taste of ice water on a hot day and being awoken by a slap across the face. Needless to say, we were wide-eyed and alert! 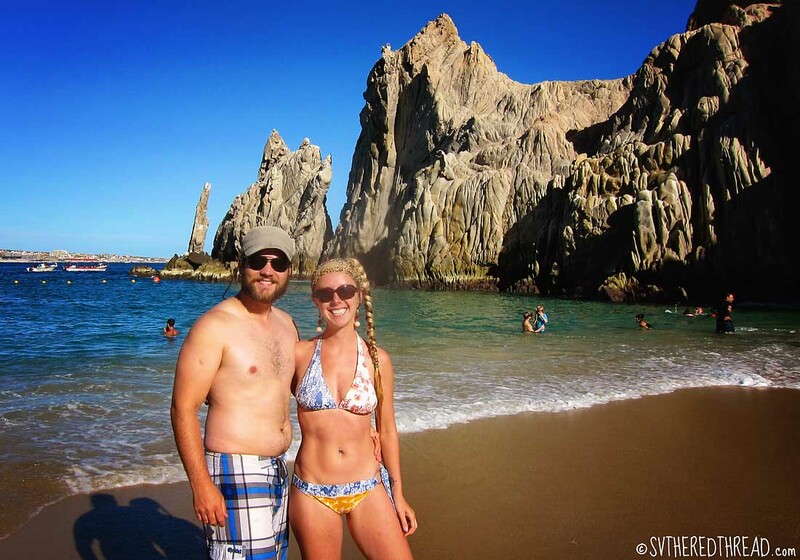 We dropped our hook in 20-feet of water on the sandy shelf that fringes the beaches of Cabo San Lucas and set out to explore a city where my then husband-to-be had celebrated his bachelor party (i.e., nearly drowned in tequila) 18 months prior. 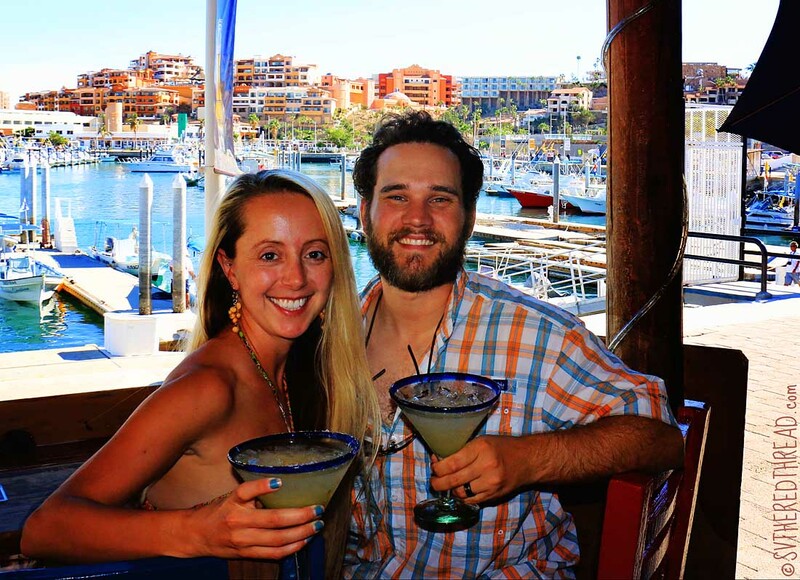 We slurped the only margaritas I’ve ever said were better than those that Neil mixes aboard and chatted up a lovely couple from Colorado at D’Right Joint, a bar whose sooty name should not influence your decision to dine there. Damn good margaritas and ceviche, I tell ya! 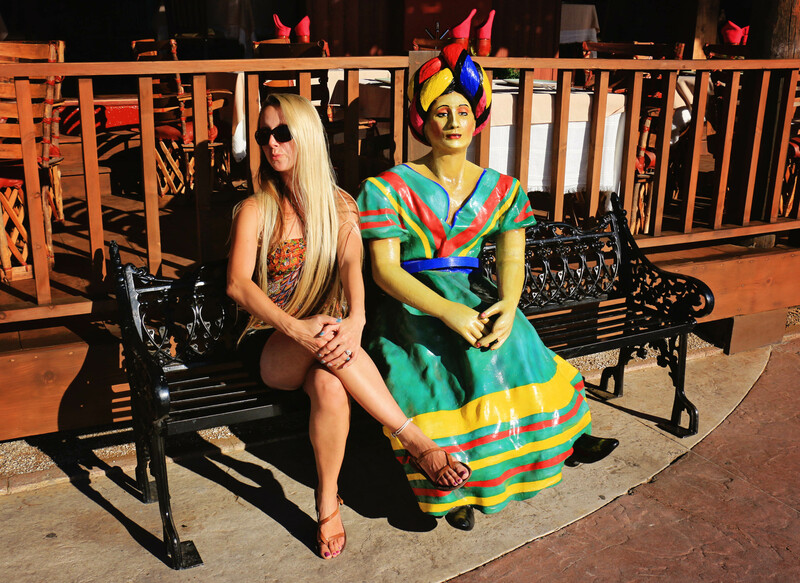 Dos margaritas and a helping of ceviche de camarón later, and we were photobombing local mannequins as we explored our way back across the tourist town. Oh what land-based fun was had by two tipsy, sleep-deprived cruisers whose 90+ hours at sea had cranked up our silliness! 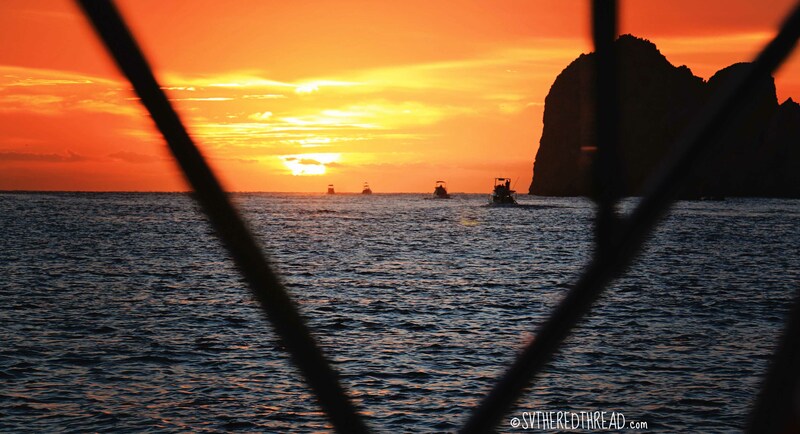 We were happily held up in Cabo for a few days, awaiting a weather window to cross the Sea of Cortez. An unexpected surprise followed the dawn of our second morning when our Namastes pulled into the anchorage! It’s hard to explain the affinity we have for John, Cindy, and Journey. 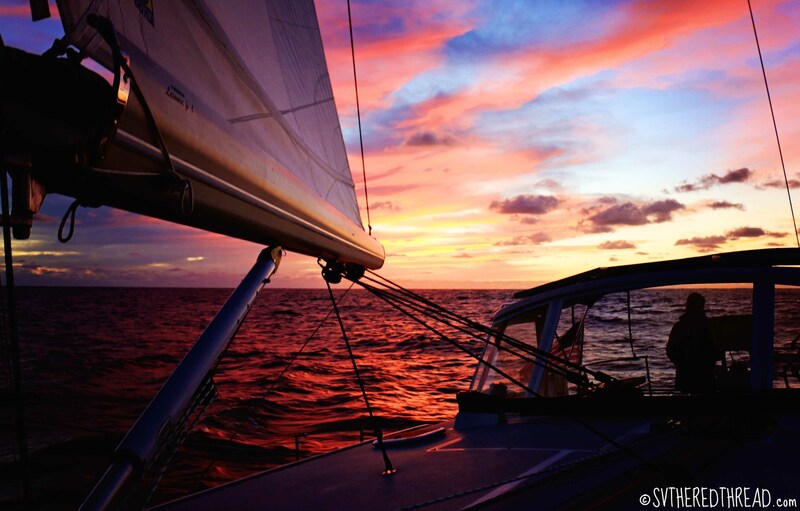 Not unlike the clan of solo backpackers whose creed I came to claim during my early 20s, the crew of s/v Namaste had become inexplicitly bound to us as we shared the challenges and joys of preparing for, and embarking upon, our respective adventures. They had become our closest kin in our cruiser family. 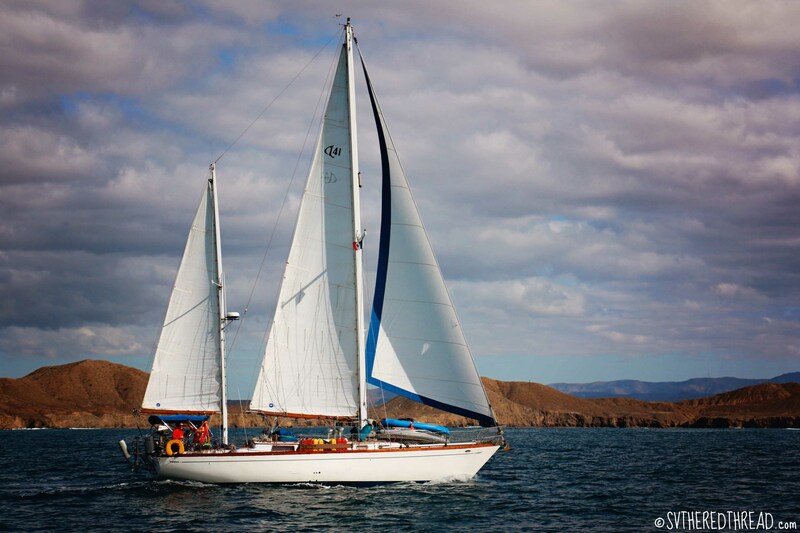 The reunion continued as the crews of s/v Astraea, s/v Kialoa, m/v Adagio, and s/v Luna rounded the southern tip of Baja and dropped their hooks as well. 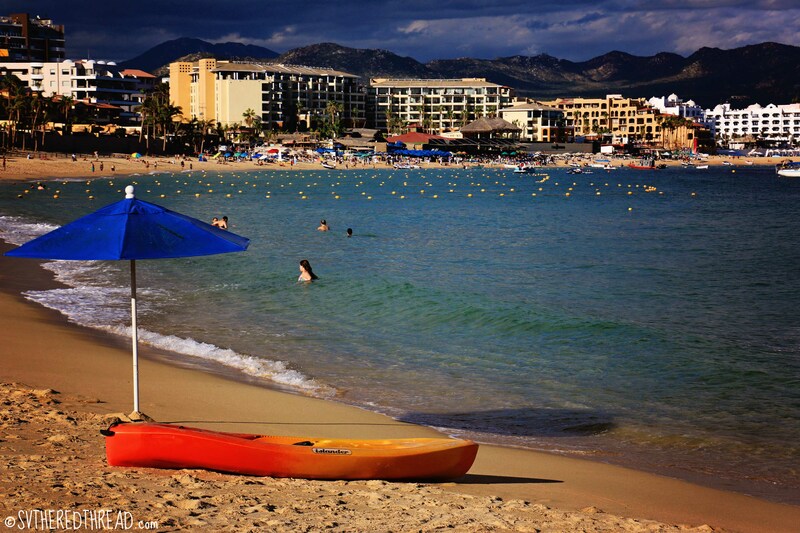 The following afternoon, all of the Umbrella Dumpers weathered surf landings in their dinghies to reach Lover’s Beach. 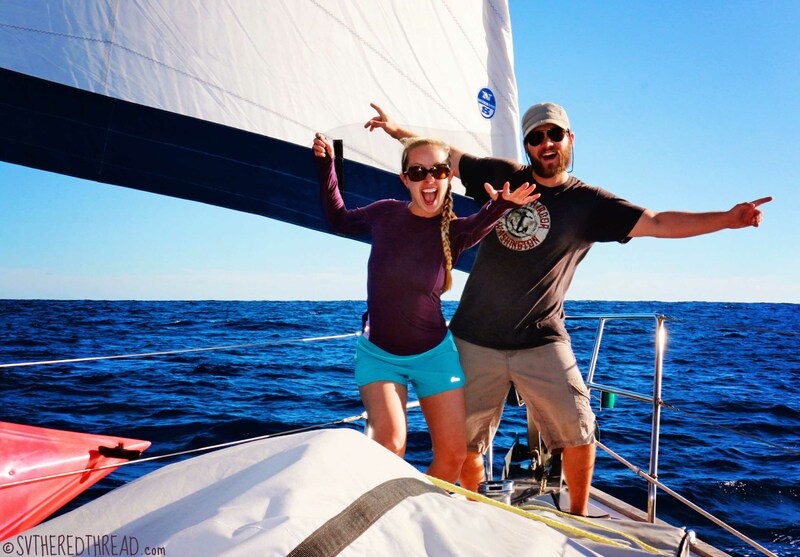 We shared nibbles and cervesas and snorkeled below cliffs that heralded our arrival in the tropics and the conclusion of our sail down the 750 miles of Baja California. Later that evening, we met with our friends to cheer on the Seattle Seahawks as they walked over the Arizona Cardinals again! Afterwards, down at the dinghy dock, Josh (s/v Kialoa) and I helped a fisherman unload some freshly caught marlin, from a 240-pound fish we’d seen hauled in a couple hours earlier. Unexpectedly, the fisherman handed us about 10 pounds of meat in thanks for the few moments of help we offered! My excitement was palpable as I jumped up and down, dancing my marlin down the dock. Pancho a locally known fish-panhandling sea lion stared at us from just below the surface of the water, begging silently for scraps. Unfortunately for him, we were not about to share! Neil and I had never tasted marlin and would find out the next evening how much we love it. Just a few hours later, at 1:30 am, Neil and I weighed anchor and waved goodbye through the darkness to the boats of our sleeping friends. This time it was really farewell as we set out to cross the Sea of Cortez for Mazatlan. Jessie’s musings: I’m finding that I don’t mind passages and actually the enjoy the rhythm we get into together. There is something freeing about disconnecting from the world and settling into a passage. I was most excited about the afternoon we spent cruising alongside the lone humpback whale. Capturing on film the moment it dove down and showed its fluke was incredible to me and something we hadn’t seen in our 2000 miles of cruising thus far. I don’t think I will ever cease to be consumed with wonder by the experience of seeing such enormous creatures in the wild. 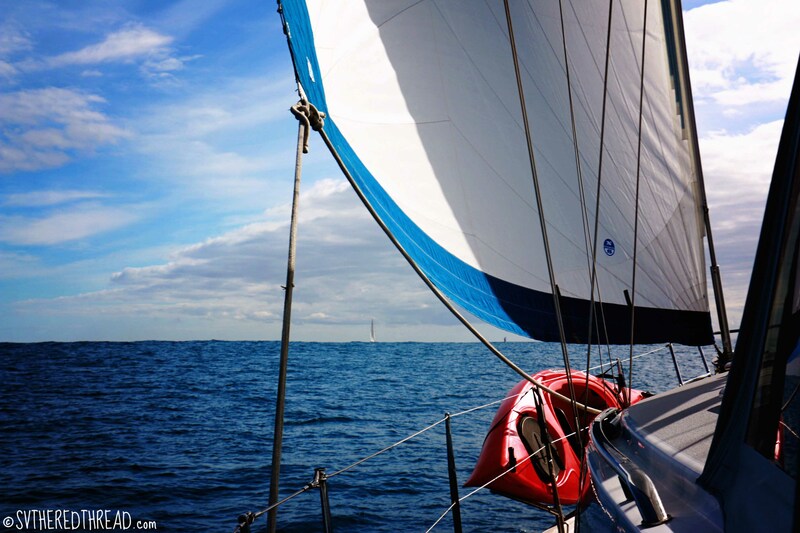 Neil’s reflections: We thankfully had a good four day passage with plenty of wind, and only a few hours of calms. It really is true that longer passages are easier and after the first 48 hours Jessie and I fall into a good rhythm that melts away the hours. As Jessie and I passed in front of Lover’s Beach, the Arch, and Pelican rock, I called my best friend and best man, Arjay, to share the moment with him. Eighteen months ago we stood on that beach looking out at the Pacific, and I told him that one day I’d sail right by there. It was really great to revel in the moment with him over the phone as I realized that promise. 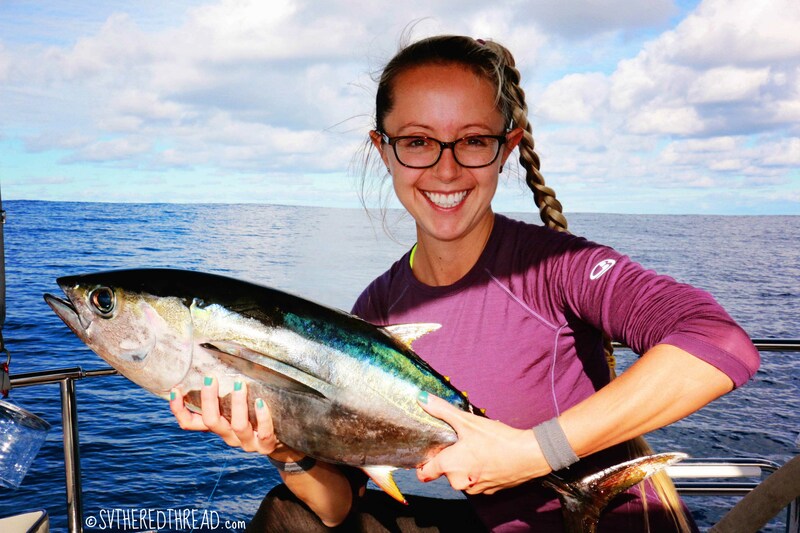 This entry was posted in By Jessie, Fishing, Friends and loved ones, Mexico, Passages, Sailing, South Pacific Stitch and tagged Cabo San Lucas MX, Snorkeling, Yellowfin tuna. Bookmark the permalink. Hi Paul & Pam! Late in our journey? I think not! We’re just getting started and are SO glad to have you along. We’ll take all the tailwinds we can get! PS. We LOVE the bread you gave us…we have been saving the last two loaves because it’s so good (and perfect now that it’s way too hot fire up the oven most days)! Keep up the great posts guys, we’re enjoying them immensely! 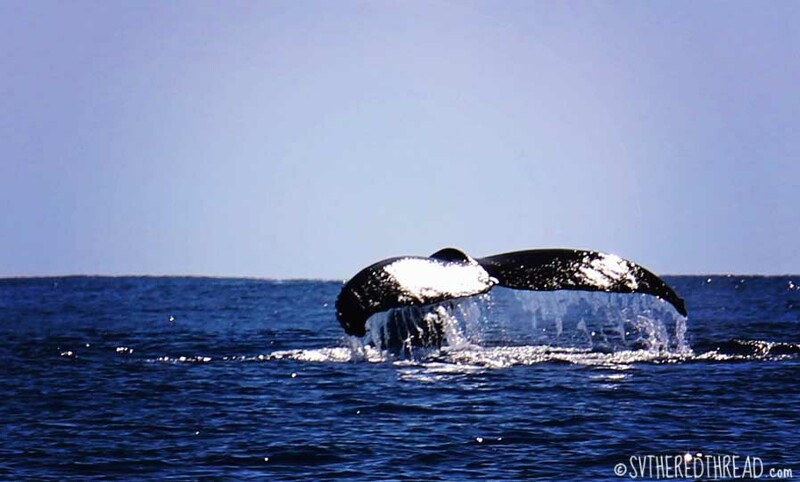 Great that you got to see such beautiful sea creatures on your passage! Loved the shot of the humpback’s flukes!